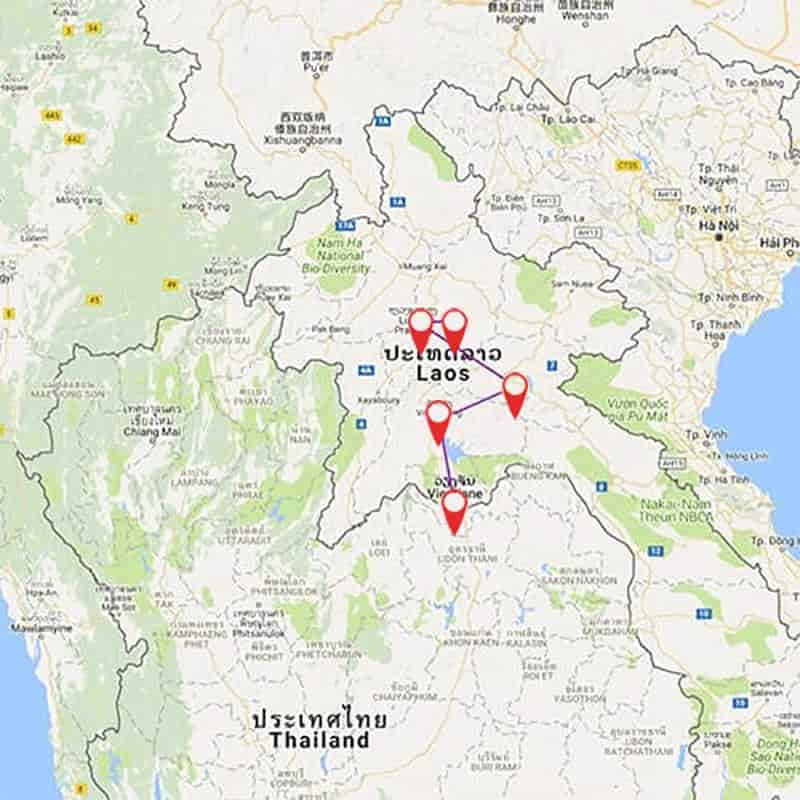 Our 09-day Essential Laos Tour tour will allows you to discover Laos’ northern beauty and top attractions such as Vientiane to the charming town of Luang Prabang and take the scenic and winding mountain roads through spectacular countryside and traditional rural villages to the small town of Vang Vieng and Xieng Khuang. 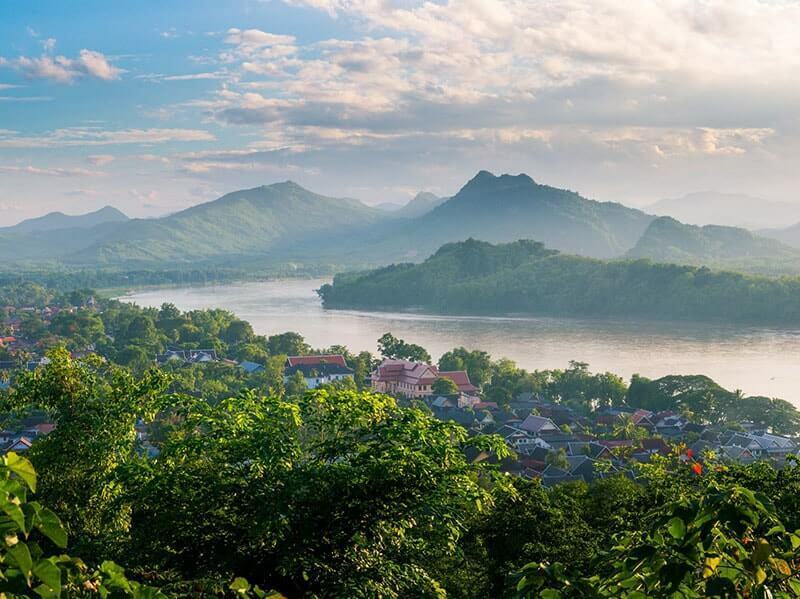 Welcome to LUANG PRABANG, the charming town in Northern Laos. Upon arrival Luang Prabang International Airport, you will be welcomed by our Asia Senses Travel Guide, then transferred to hotel for check in. Depend on your actual arrival time, some soft sightseeing for an orientation tour is suggested. In the evening, free to discover the bustling night market at your own pace. Luang Prabang is located in the northern of Laos and is around 360 km north from Vientiane. Since 1995, UNESCO has declared Luang Prabang a World Heritage site for it’s preserved architectural, religious and cultural heritage, a blend of the rural and urban developments over several centuries, including the French colonial influences during the 19th and 20th centuries. After breakfast, pay a visit to Wat Xieng Thong - one of the most important of Lao monasteries and remains a significant monument to the spirit of religion, royalty and traditional art. After that, move to Wat Sene Souk Haram or literally "Temple of a 100,000 treasures" is one of the most beautiful temples in Luang Prabang, singular by its restored painting of a deep ochre colour, flamboyant and glittering with gold. Then continue your tour to the impressive stupa of Wat Visoun (oldest temple in Luang Prabang) and the shrine of Wat Aham. Tasting the best of Laos in restaurants which are suggested by our your guide. In the afternoon, visit the National Museum. It is the former Royal Palace which was built in 1904 during the French colonial era for King Sisavang Vong and his family. The Museum hosts a range of interesting artifacts from the Royal period in Luang Prabang. NOTE: National Museum closed on Mondays. 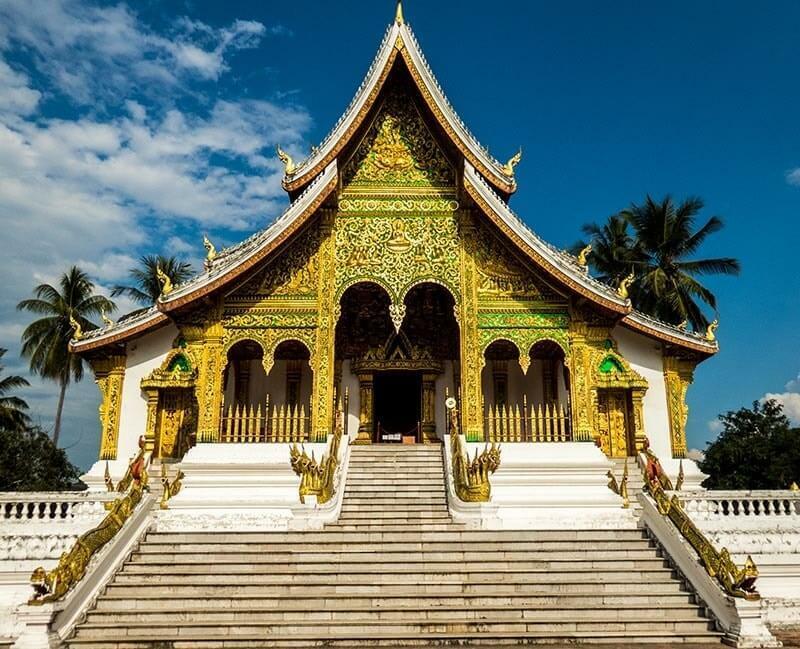 After that, continue tour to visit Wat Mai - one of Luang Prabang’s largest and most richly decorated temples. Both its interior and exterior are extensively adorned with black and red lacquer decoration and gold leaf. At the late afternoon, start climbing up 328 steps to the top of Mount Phousi, for panoramic views of the city, surrounding countryside and witness the memorable sunset, one of the most unforgettable sights on this tour. This morning, our driver will transfer us to a pier on Mekong River. 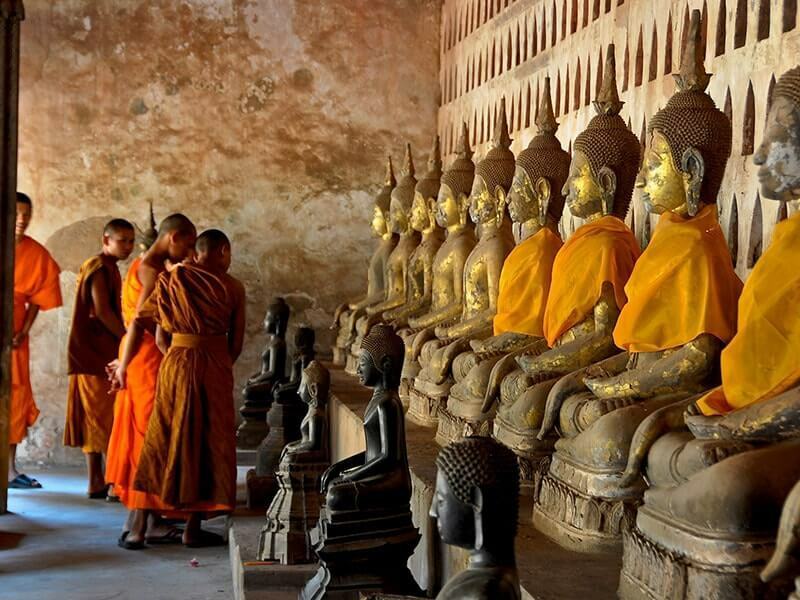 Start a Mekong River Cruise trip on the mighty Mekong River to visit the famous & sacred Pak Ou Buddha Caves. These caves, overlooking the confluence of the Mekong & Ou Rivers from on high, have been home to many thousands of Buddha images that were placed here by local people since 16th century. On the way back, make a short stop along the way to visit a local village where they make a living from weaving on ancient wooden looms. After that, broad back Luang Prabang for lunch. In afternoon, continue to visit Kuang Si Waterfall, where you will enjoy beautiful natural scenery, have fun in waterfalls and relax. On the way back, stop to visit a Black Hmong village. You will see and chat with villagers who make handicraft as souvenirs and sell them for visitors. Free at leisure at your hotel. In the early morning, wake up early to the sound of the temple gong and witness Luang Prabang’s mystical daily ritual. 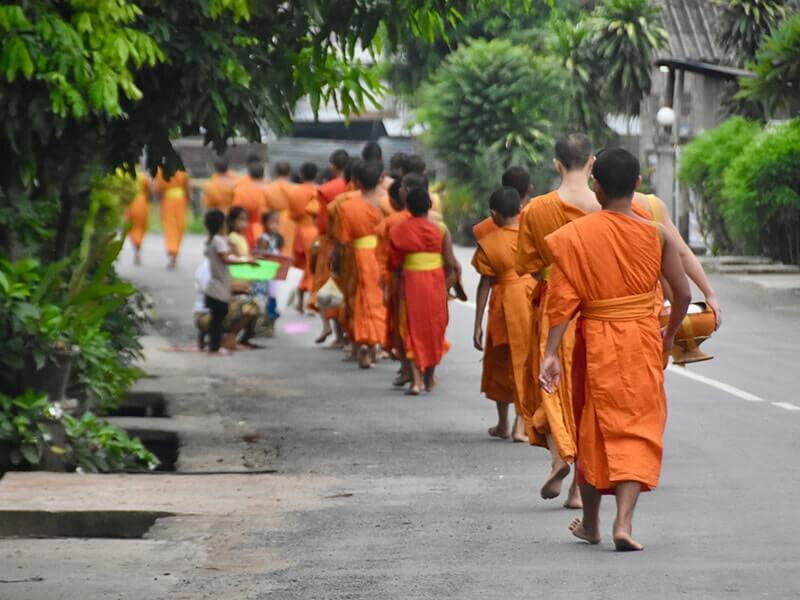 Observing a procession of thousands young monks walk silently by, collecting sticky rice and other foods in their bronze bowls along the streets of Luang Prabang. After breakfast, head off on your road trip to XIENG KHUANG. It takes about 8 hours to drive from Luang Prabang to Xieng Khuang. Along the way, make a stop to visit remote villages where you can get a glimpse of Laos daily life and chat to the locals. Xieng Khouang is a mountainous region full of caves and plateau. From an aircraft, you will observe how large the province is with its vast plateau. By early evening, arrive at your hotel in Phonsavan, the gateway to the Plain of Jars. If time permits, visit the side B of Plain of Jars. Visit the mysterious Plain of Jars - mysterious and ancient, the stone jars are apparently carved out of solid rock and area scattered all over the plateau - from sunrise until lunch. 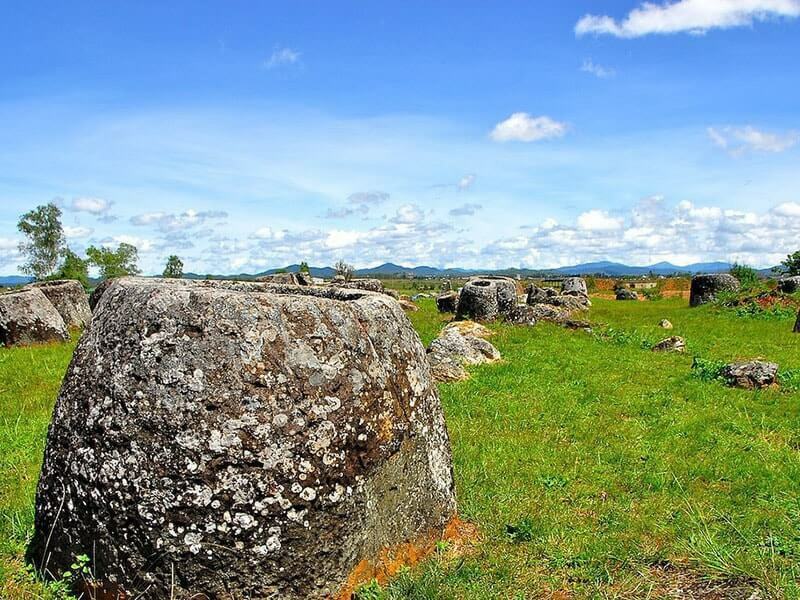 The Plain of Jars archaeological site is believed to be over 2,000 years old, remains a mystery. Huge jars of mysterious origin are arranged haphazardly in over a dozen different groupings, including several hundred in five major groups. Wander among them and try to imagine their history yourself. 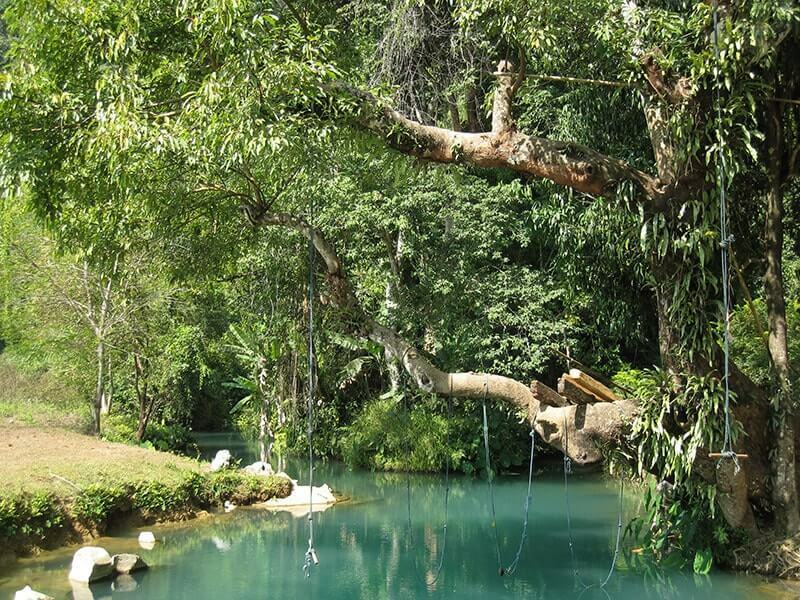 After that, take a six-hour drive along picturesque winding roads to VANG VIENG. Enjoy the beautiful sceneries, stunning vistas of towering limestone karst hills around every turn and enjoy great photo opportunities of Hmong tribal villages along the way. Arrival in Vang Vieng, check in to the hotel for a good night rest. 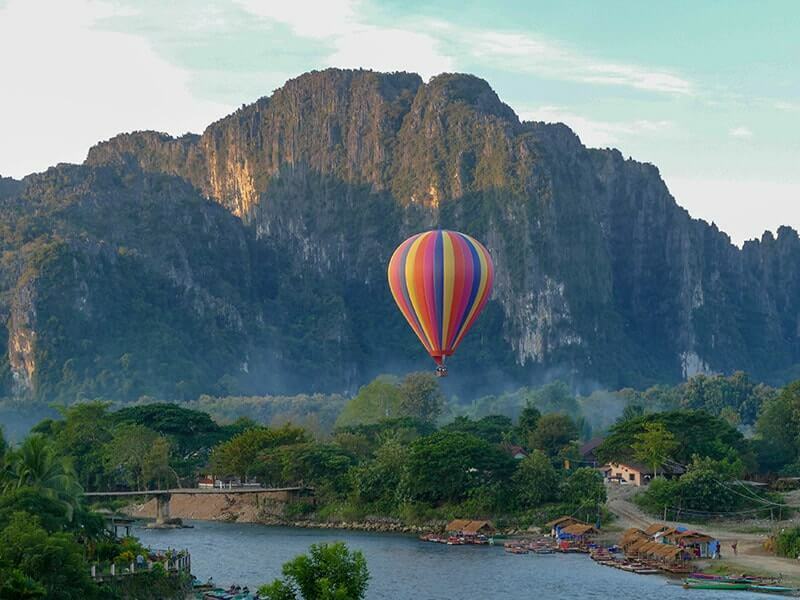 Enjoy the scenic wonders of Vang Vieng at your leisure. You can trek through countryside, visit caves and have picnic lunch outside cave, tube in the cool, lazy river, try your hand at kayaking or slow boat ride back to town, or just relax and enjoy the amazing views from your balcony. Overnight at hotel in Vang Vieng. This morning, explore the network of caves surrounding Vang Vieng. Visit Tham Chang, with its vast panoramic views, and Tam Xang, or the Elephant cave, where the limestone formations create an image of an elephant. After that, travel to VIENTIANE. It takes three hour to drive from Vang Vieng to Vientiane. On the way, visit a Temple ruin of Mons "Vang Xang", a place with old Buddha statues from 11.Century. Upon arrival in Vientiane, check in your hotel and free at leisure. Today is spent to visit Vientiane, the charming capital city of Laos with rich heritage of Buddhist culture. Your guide will take you to visit the highlights of Vientiane, starting with a visit to the symbolic site Pha That Luang Stupa - the most important national monument in Laos. 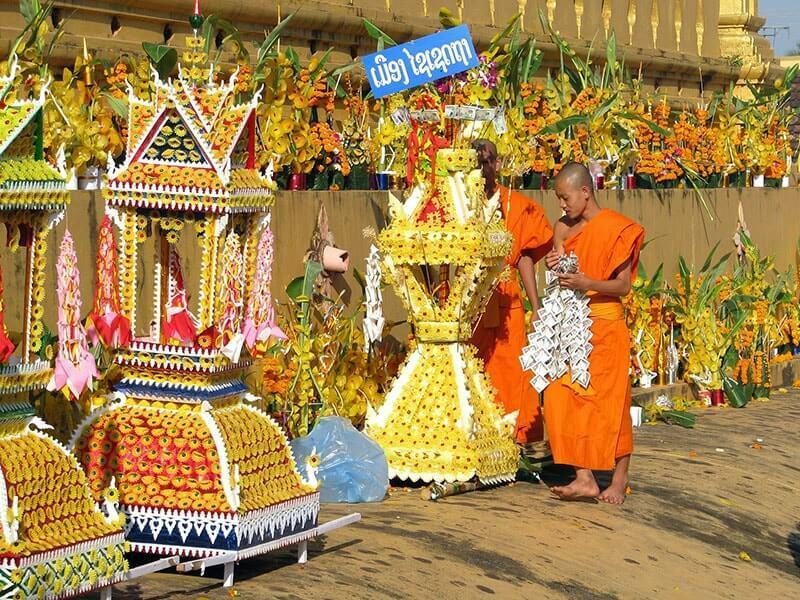 It is a symbol of Buddhist religion and Lao sovereignty. Then, move to Patuxay Monument (Victory Monument) which is located in the center of Vientiane prefecture. You could climb up to the top of this monument and enjoy a panoramic view of the city. Continue to Wat Sisaket which is the oldest surviving temple with thousands of Buddhist images. These images mainly date from the 16th and 19th centuries and come in all sizes and are made from wood, stone and bronze – more than 6,800 Buddhas in total. After that, visit Wat Si Muang and Wat Prakeo which housing the famous Emerald Buddha image really amazed the Indochina tour makers. 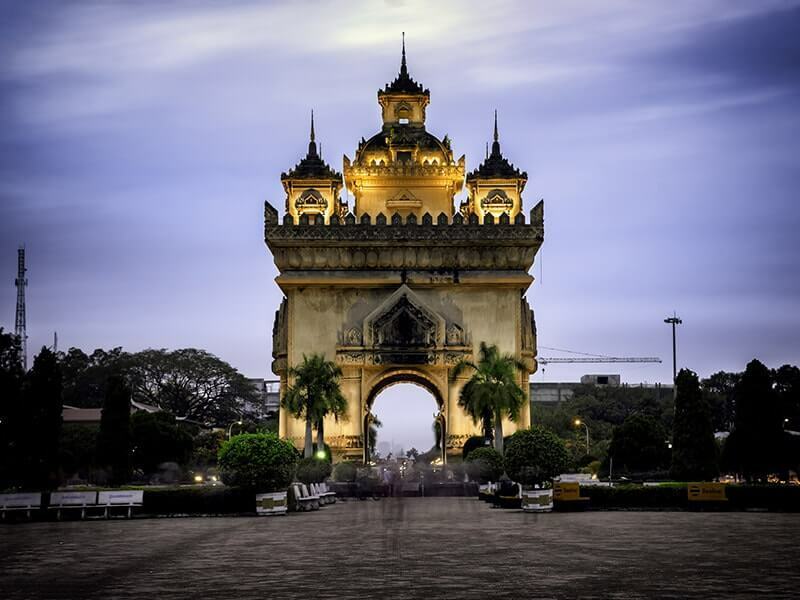 In the afternoon, stop by Lao National Museum the best place to learn about the history, cultural and people of Laos. After that, visit the Dong Mak Khai Market where locals come and trade vegetables, wild life animals, handicrafts and other poultry. Our Essential Laos Tour comes to an end today. Free at leisure until our guide and driver come to pick up then transfer you to Vientiane International airport for your onward flight to home. We thank you for your patronage & look forward to serving you again in your next journey in Laos. Items of a personal nature such as laundry, drinks, etc.